Drop everything because Ariana Grande‘s new album is finally here! After a long and torturous wait, the singer finally dropped her much-anticipated fifth studio album, “Thank U, Next,” and uh, it’s filled with bops. 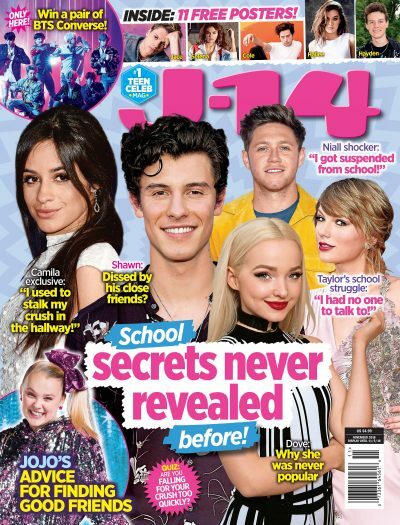 That’s right, you might want to grab your headphones because if you’re anything like us over here at J-14, we bet you’ll have the songs on repeat all day long! But the more we listen to it, the more we start to wonder: What do these songs actually mean? Are there any hidden messages in the lyrics? Who are they about? Well guys, we decided to investigate, and it turns out there are actually a ton of Easter eggs in the new tunes. From Pete Davidson to Mac Miller, the singer covered almost everything in her life. It’s clear that she did not hold back. Lucky for you guys, we’re here to break it all down for you. We went ahead and decoded the lyrics from each and every song on the “God Is A Woman” songstress’ new album, so prepare to be shook. In the catchy tune, Ari describes a super-sweet and romantic relationship, and it honestly couldn’t be cuter. She sings about staying up all night and eating pad thai with someone, taking bubble baths, and kissing and cuddling the mystery man. Many fans believe that the lyrics are about the singer’s ex-boyfriend and longtime friend, Mac, who passed away from a tragic overdose back in September. They think that in the song, Ariana is imagining what life with Mac could be like now. As J-14 readers know, the couple dated for almost two years before splitting back in May, but ever since his tragic death, the 25-year-old has been very public about how much she’s missing him. Fans also noticed that the rapper had an “Imagine” tattoo on his inner bicep. All the clues are definitely pointing to Mac for this song and ugh, our hearts are breaking. It turns out, “Needy” isn’t really about any man in particular, but instead, it focuses on the singer’s internal struggles. Ariana keeps it pretty real in the catchy song, and we’re loving it. It’s clear that Ariana, just like the rest of us, can fall too hard for a guy. Don’t worry Ari, you’re not the only one! When Ariana first dropped the track list for the album back in January, fans quickly assumed that “NASA” would be about Pete. Why, you ask? Well, the Saturday Night Live comedian wore a NASA shirt at the 2018 Video Music Awards, which he attended with the singer. But Ariana’s BFF Victoria Monet explained via Twitter that the song was way more than that. “Yo I promise we did not write a whole song about this mans shirt … promise. it’s just a universally common word,” she wrote. Now that the songs out, we broke down the lyrics and it definitely seems like it could be about Pete. The song is all about needing some healthy distance from a man, so that Ariana could love him more. There are certainly a ton of clues that “Bloodline” is also about her ex-fiancé. The song is all about having feelings for someone but realizing you don’t want them in your family. Now, J-14 readers know that Ari and Pete were set to get married last year before calling it quits. And the next step after marriage is having kids, right? Well, when you have kids with someone, it’s said that you’re expanding your bloodline, so yeah, all signs are definitely pointing to Pete! Probably the saddest song on the album, “Fake Smile” is all about being tired of acting like you’re OK when you’re not. The singer has been pretty open about the rough year she had last year. Between her very public breakup with Pete and losing Mac, she’s definitely been through a lot. It seems like “Bad Idea” is all about hooking up with an ex, even though you know it’s wrong. We’re not sure who this one is about, but considering she’s been spending a lot of time with her ex Ricky Alvarez lately, our guess is it’s about him! Although the two have confirmed that they’re just friends, they’ve been spotted hanging out a bunch lately. And the singer even hinted that her former flame was going to join her on tour when she left a mysterious comment on his Instagram pic. Although we’re not sure who Ariana’s song “Make Up” is about, it’s definitely somebody the singer feels pretty passionate about. The “God Is A Woman” songstress sings about how much she loves to fight with the mystery man, just so that they could make up. “Promise me that when you kiss my lips, you’ll make it stick / That’s the way to shut me up after an argument / No eyeliner on, but looking at you is the fix / Highlight of my life, just like that Fenty Beauty kit,” the lyrics read. You might want to grab your tissues for this one. Fans are speculating that “Ghostin,” the slow and beautiful ballad, is all about Ariana dating Pete, but wanting Mac instead. The 25-year-old seemingly praises her man for sticking through the tough times with her. Although she hasn’t confirmed it, we definitely see how this could be about Pete and Mac. We may or may not be crying! The emotional song starts off with a voicemail from her close friend Doug Middlebrook. Naturally, fans were quick to assume the fiery song is about Pete, and there’s certainly a lot of clues. Ariana sings about thinking someone was the one, but getting her heart broken when she found out they weren’t who she thought they were. And it true Ari style, she even threw in a bit of shade. “7 Rings” is all about female empowerment, and we’re loving it. The song focuses on the 25-year-old living her best live with her six besties as she sings about her favorite things. Who needs a man, right? The first single off the album, “Thank U, Next” has been on repeat for months now. Everyone knows that like “7 Things,” “Thank U, Next” is all about the girl power. The former Nickelodeon star sings about finding a new relationship, but this time it’s with herself. “I met someone else / We havin’ better discussions / I know they say I move on too fast / But this one gon’ last / ‘Cause her name is Ari / And I’m so good with that,” the lyrics read. She does however, give a shoutout to all of her ex-boyfriends, but she’s actually not throwing any shade! The song is all about being grateful for her past relationships, because they shaped her into the person she is today. “One taught me love / One taught me patience / And one taught me pain / Now, I’m so amazing,” she sings. But although she’s thankful, she’s over men and ready to focus on herself now. Although there was a ton of speculation that this song was going to be about her ex Big Sean, it turns out it’s actually inspired by someone she’s never even met. In the song, Ari sings about wanting the mystery man to break up with his girlfriend, so they could be together.